It feels weird to make an announcement post of this, and it’s taken me days to write somewhat coherently (still fighting cooties), but I’m pushing publish as is. Apologies to thems that want one, but I’d rather do it this way than do it personally or have anyone surprised or worried, and have to console them, because that’s not what this is about. It’s about accepting a tool and empowering myself with it, as I face an arduous drive to visit family in Texas and enjoying it as fully as physically possible. But, you know me, it’s really about chasing giggles and my refusal to stop when my body fails but otherwise am well enough to go. And since I’m currently fighting cooties and feeling like an exposed raw nerve, I may as well be transparent before I change my mind, in case it helps someone else someday, somehow. So, last Labor Day weekend, 2015, I was in bad physical shape with lots of pain. I was also unwilling to miss out on a planned trip to the National Zoo, however, with family and dear friends. My choices were to either miss out and stay in bed OR swallow my pride and use a wheelchair loaned to me recently by dear friend, Lisa. Our son, his wife, and their son were moving away the next month and I just didn’t want to miss a second with them. It was a glorious and happy, yet inconvenient day. And spending that time seated allowed me to physically feel well enough to attend a friend’s birthday celebration the next day, where Chooch and I introduced our grandson to friends that hadn’t met him yet. Although migraine stuff made me miss some of it, but, hey I was there! But I was embarrassed and it was so inconvenient for Chooch and the rest that I chose to kind of forget about it. Until visiting friends earlier this month beyond The Wall, aka, the Canadian border. It was a delayed November anniversary prezzie to each other, delayed for passports and the promise of spring. We had stuff we wanted to see, but mainly visit with old and new friends we don’t often (or ever!) see in a less-chaotic-than-Balticon setting. We arrived Friday and did a bit of walking but retired early for recovery and fun the next day. I was fighting neurological stuff on Saturday until later in the evening when the physical pain and intense fatigue was hitting hard. We collapsed as soon as possible, but it was clear I pushed too hard while distracted with Niagara Falls, Toronto, a casino, a FrankenBurger King, butterflies, poutine, a romp through a Hollywood wax museum, but mainly enjoying our small group vibes in Buffalo + Canada to the point of addiction. They were all so kind and cautious about my health issues that it made them even more irresistible. We had plans on Sunday to go to an aquarium, a lifelong passion of mine. It’s a shared passion and Chooch and I visit in every city, and drag along kids, whenever possible. But I found myself unable to walk beyond minimal needs after the excursions the days before, essentially because of my refusal to halt them earlier. I did the usual triage, heavy meds and leg elevation and soaks back at the hotel, but my body simply needed more recovery time before doing any walking and I was facing a day alone in the hotel room. In bed again, just a different place. Chooch would have offered to stay but I’d have kicked him out. 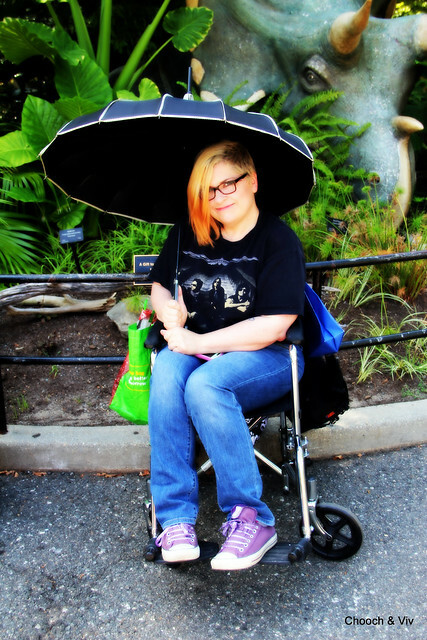 I was pretty devastated, so when it finally occurred to me, I scrambled to the Ripley’s Aquarium in Toronto website and yes, they lend wheelchairs for free on a first come, first serve basis. We weren’t even sure there would be a wheelchair available until we arrived and I really had no back up plan, other than napping in the car, but I was so swiftly and kindly accommodated that I only remember it as a blur of kindness until I found myself just inside the entrance – warm, seated comfortably with Chooch in front of the first sea life display as friends Nutty and Tek arrived. They’d had very little warning of my situation, but I know they are utterly accepting of my disabilities, and they were more kind and patient with the inherent inconvenience and delays. I chose to go to the aquarium and risk embarrassment (few wheelchair riders seem to have cotton candy colored hair apparently, so I really stand out!) and am now choosing to share more pix, to show what I look like when in a chair and that I’m fine! But more importantly, to show what I gain when I choose to swing from the chandeliers by bracing for stares and inconveniencing the HELL out of those that let me. FACT: When you’re this age and this size, many adults assume you’re being lazy. It’s why I never go to the store if I need an electric cart. Nope. Parking in handicapped spots, legally, is bad enough. But since I handily put away fears in face to face interactions, with family, friends, strangers and their kids, I’m also putting aside fear of ridicule by or accusations of sympathy and attention seeking. Becoming disabled at 40 with an invisible illness has been quite educational in teaching that no matter how intelligent, respected and seemingly kind people can be, in real life, that’s not always the case. Nothing stings quite as badly as when it’s someone I care about, but time heals all wounds, so don’t waste any more of my time if that’s your opinion. #HarshlyWorded? Can’t tell, #PainCranky. A wheelchair won’t work every time to get me where I want/need to be, and that’s okay. I know I reach for every brass ring, and if others doubt that, I just will not waste energy on defending myself further. Clearly, it was a big deal for me, so I’m getting my own travel chair in case of need, to make it more possible for me to be out of my room and enjoy the special bonding time with far flung friends. Especially at the new, larger, more spread out convention hotel. If anyone has recommends for a lightweight travel wheelchair, plz and thank you link in the comments. Click on the image below to go to the full Flickr album, if you like. That’s where the good stuff is… yup, my grandson at five months old, last Labor Day weekend at the zoo. *For those that may be now considering a wheelchair for travel, I’m writing another post with my views in the next few days. No shame! There is nothing as inconvenient as not seeing you at all. You are (occasionally) a wheeled cyborg! I hate the idea that someone who is larger and in a wheelchair is just being lazy, as if riding a wheelchair is some treat, like it’s easy to use a chair or to navigate the public while disabled.